Both of Cookstown’s fire trucks were deployed to the scene of a fire at a domestic garage in Cookstown just before 7.30pm on Saturday. Residents of the attached home are understood to have been alerted to the ‘accidental’ blaze by smoke alarms. Fire crews had dealt with the Burn Road inferno inside 40 minutes. A spokesperson for Northern Ireland Fire and Rescue Service said: “Northern Ireland Fire & Rescue Service received a call at 7.26pm to a report of a fire at a garage in the Burn Road area of Cookstown on Saturday 16 January. 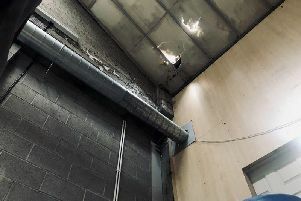 “Two Fire Appliances from Cookstown Fire Station were deployed to the scene of a fire in a private garage in the area. It is believed that working smoke alarms inside a house attached to the garage actuated during the incident.